My boyfriend and I love having salad with our dinner, but it’s hard to find time in our hectic schedules to make a fresh salad every night. 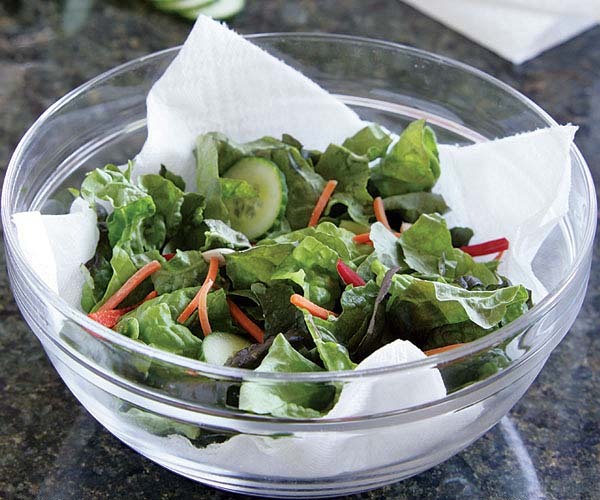 To remedy the situation, I line a large, flat bowl with paper towels and prepare several days’ worth of salad on top of the towel layer (excluding wet ingredients like tomatoes, which I add at the last minute). I cover the salad with another layer of paper towels, wrap the bowl in plastic wrap, and I have the week’s fresh salad waiting for me.